I’ve been in a serious creative funk since I made those witches for Halloween and finished the Circle Quilt (which still isn’t hung). That was the last thing I sewed, the circle quilt. Last year I made tons of gifts for people, but this year I took a big break from the homemade gifts. Time wasn’t on my side, and I just haven’t been struck with much inspiration the past month. Adam was sick, then I was sick. I’ve been putting a lot of energy into projects at work, and we’re also traveling for Christmas this year. It’s hard for me to get too excited about holiday craft projects when we won’t be here for the actual day. Don’t get me wrong, I’m actually excited to go out of town and be a guest rather than a host this year. But I decided I’d rather relax and spend more time with family and friends this year than work away at the sewing machine. Maybe in 2010 I will be super organized and start my homemade gifts in June. I’ve also learned not to get too excited when the holiday fabrics start coming out. I didn’t do anything with mine this year, so next year I’m going to have to work overtime to cover the house in holiday cheer, just to make up for the stash I’ve been accumulating. Because I know next year I’m not going to have the willpower to not buy ANY holiday fabrics. 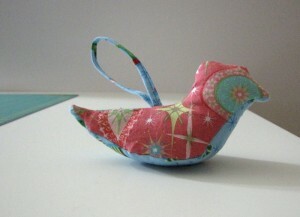 This little bird ornament is the only homemade thing I put together for the holidays this year. It’s a gift for Adam’s stepmother, and it’s from Joelle Hoverson’s Last Minute Patchwork + Quilted Gifts. He came together pretty quickly, and I like him. I may make some more for our tree next year, but this first attempt went pretty well. The stomach and the hanging loop are from a fat quarter that came in a bundle I bought ages ago. The pink fabric is a new one I bought this year, from the “Have a Sheri Berry Holiday” line by Sheri Berry. He’s pretty neat.